A new report, “The People’s Prescription: Re-imagining health innovation to deliver public value,” calls for restructuring research and development innovation systems to create, rather than extract, value. It also calls for long-term “mission-oriented” public investment, and a public return on this investment. “Health innovation is about making new treatments and cures available to the people that need them. Profits might be earned but not at the cost of doing what the health system is meant to do: heal,” Mariana Mazzucato, professor in the Economics of Innovation and Public Value at University College London (UCL), and director of UCL’s Institute for Innovation and Public Purpose, said in the introduction of the report. 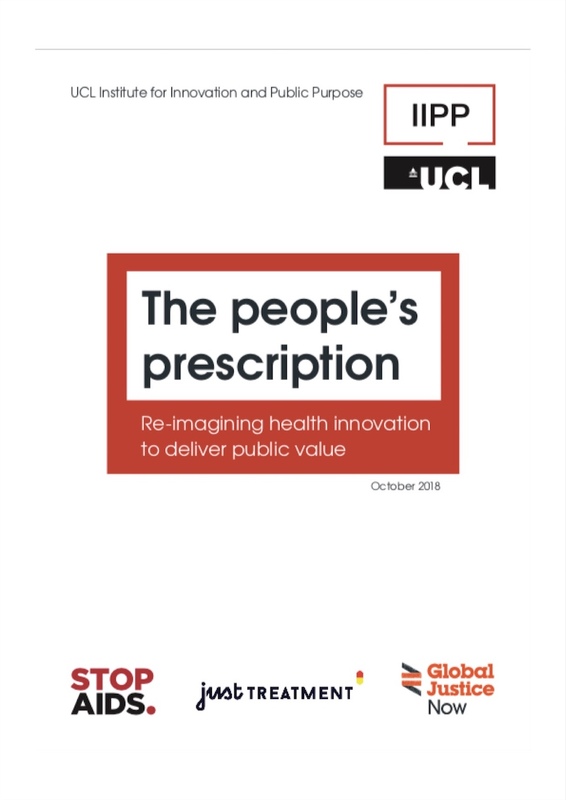 The People’s Prescription: Re-imagining health innovation to deliver public value [pdf] was released today, 15 October, and is the result of a collective effort between Mazzucato through the UCL Institute for Innovation and Public Purpose, and STOPAIDS, Global Justice Now and Just Treatment, according to the report press release. The report will be officially launched on 17 October in London. “A pharmaceutical industry that makes billions in profits without providing the affordable medicines that people need is one of the scandals of our time,” Heidi Chow, senior campaigns manager at Global Justice Now, said in the report press release. “Until governments follow the recommendations in this report and set about creating a pharmaceutical system that puts patients and public health at its core, our health and our health systems will continue to suffer as pharmaceutical profits continue to soar,” Diarmaid McDonald, lead organiser from Just Treatment, also said in the release. To gain an inside perspective on this new report, Intellectual Property Watch spoke with Saoirse Fitzpatrick, senior advocacy adviser at STOPAIDS, who was involved in writing the report. “STOPAIDS is a membership network of 70 organisations with a distinguished thirty year history of engagement on international development and HIV and AIDS,” according to the STOPAIDS website. “Four years ago, we [STOPAIDS] came to the decision that we were going to have to keep on campaigning for access to ARVs [antiretroviral drugs] and drugs for related co-infections as long as we have the current system that we do, that rewards innovation with market monopolies,” Fitzpatrick said. “There’s such a waste of resources because of the over-financialization of the sector, because we don’t have public health driving the R&D agenda. We have all this money going into producing these ‘me-too’ drugs, these ‘copy-cat’ medicines, rather than doing meaningful R&D from scratch. The whole process is un-transparent – there’s not enough public accountability anywhere,” she said. The report takes “all those problems and then it sets out some key principles of how a ‘healthy’ innovation model for health would work, and it does an analysis of case studies from different countries and different contexts, looking at where innovation has been done well,” she said. “So, we’re trying to promote this value creation into a model which at the moment is very focused on value extraction,” she said. “A key message within the report is that we need the expanded role of the state, we need to redefine roles and the relationship between private and public actors, and in that, balance the risks and the rewards between those actors,” Fitzpatrick said. “As the number of countries struggling to afford new medicines grows by the month, and patients are increasingly denied access to treatments that could heal them, the question for political leaders and policy makers is not whether they should initiate action to deliver a public value centred health innovation model, but when,” the report concludes. Contributors to the report include: John Abraham (King’s College London), Brook Baker (Northeastern University School of Law and Health GAP), Christine Berry (independent researcher), Michelle Childs (Drugs for Neglected Diseases initiative), Jamie Love(Knowledge Ecology International), Rohit Malpani (I-MAK), Kaitlin Mara (Medicines Law & Policy), Azzi Momenghalibaf (Open Society Foundations), Yannis Natsis (European Public Health Alliance), Judit Rius Sanjuan, Jack Scannell (Innogen), Ellen ‘t Hoen (Medicines Law & Policy), Els Torreele (Médecins Sans Frontières, Access Campaign). "“The People’s Prescription”: New Report Calls For Value Creation Instead Of Value Extraction In Pharmaceutical R&D" by Intellectual Property Watch is licensed under a Creative Commons Attribution-NonCommercial-ShareAlike 4.0 International License.